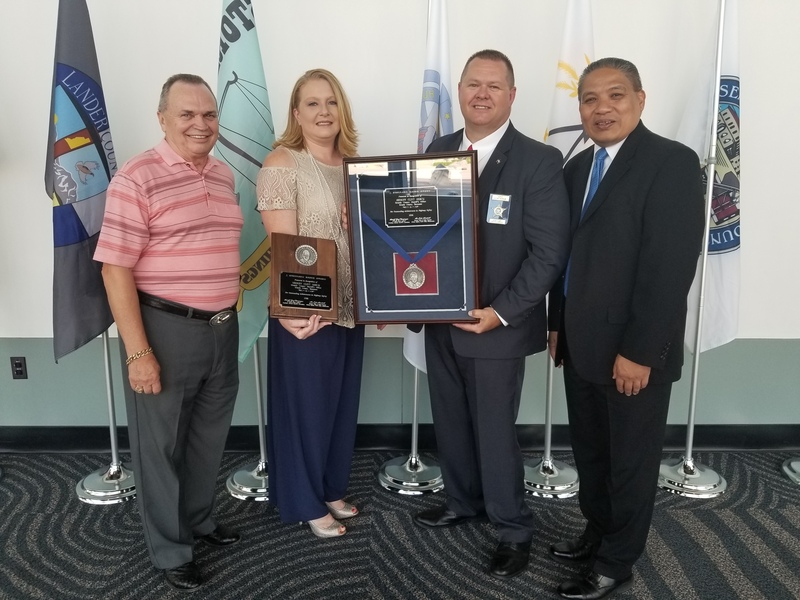 Alexandria, Va. - The National Sheriffs’ Association is pleased to announce that Sheriff Clint Shrum of Grundy County Sheriff’s Office, Altamont, Tennessee has been selected as the winner of the J. Stannard Baker Award for Traffic Safety. Sheriff Shrum accepted the award on behalf of his sheriff’s office and the proud men and women who makes his work in traffic safety possible. The award was presented at the NSA’s Opening General Session with NSA President Sheriff Greg Champagne, the 37th Deputy Attorney General of the United States Rod Rosenstein, Mr. John Marshall, Director of the Office of Safety Programs for the National Highway Traffic Safety Administration, and Retired Sheriff John Whetsel, Oklahoma County, Oklahoma, Chairman of the NSA Traffic Safety Committee. This lifetime achievement award recognizes a sheriff or deputy sheriff’s work and outstanding contributions to traffic safety. The award is sponsored by the United States Department of Transportation - National Highway Traffic Safety Administration (NHTSA), the Northwestern University Center for Public Safety, and the National Sheriffs’ Association’s Traffic Safety Committee. Recognizing Traffic Safety as a conduit to curb deaths and injuries on our nation’s roadways but also as a means to curb other crimes in our communities, the award recognizes unusual initiative and imagination in developing and promulgating traffic safety programs. With twenty seven years in traffic safety and law enforcement, Sheriff Shrum began his law enforcement career in 1990 with the Tracy City Police Department and continued with the Winchester Police Department during which he served as the Governor’s Highway Safety Office. His work on the Click It or Ticket campaign, the development of the first child passenger safety and DUI enforcement programs were exemplary during these years. In 2006, Shrum worked with the Cumberland Region Law Enforcement Liaison, coordinating 28 counties and 85 different agencies and oversaw the ARIDE program specifically, training over 1,000 law enforcement personnel and a 29% decrease in fatalities. When he was elected Sheriff in 2014, Sheriff Shrum immediately partnered with his surrounding police departments of Monteagle and Tracy City, the Tennessee Highway Patrol, and all first responders. He adopted the Data Driven Approaches to Crime and Safety, linking traffic and other crime area nexuses, certified all of his road deputies in SFST, Advanced Roadside Impairment Driving Enforcement (ARIDE), and one Drug Recognition Expert. Sheriff Shrum increased seat belt compliance to 73% under his short tenure as sheriff. 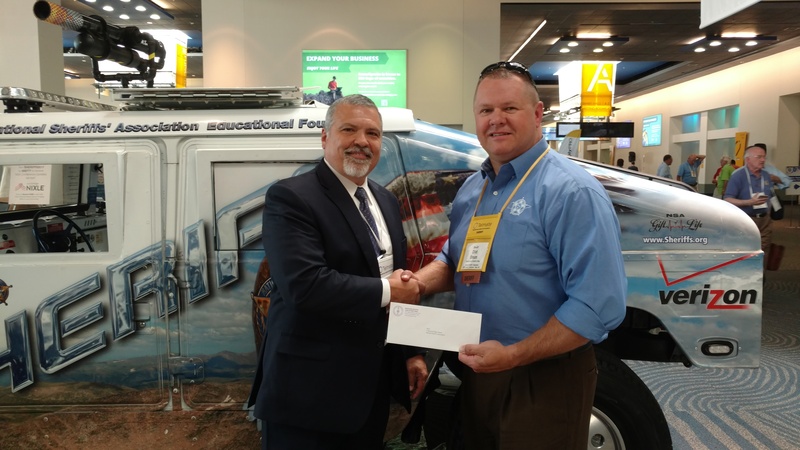 Victor Beecher, from the Northwestern University Center for Public Safety, presents Sheriff Clint Shrum with a series of crash reconstruction courses from Northwestern University, valued at $6,800.00 as part of the prize package for the J. Stannard Baker award for lifetime achievement in Traffic Safety. Clint is a graduate of the Tennessee Law Enforcement Training Academy and holds his degree in Theology and Criminal Justice Administration. Additionally, he holds a number of instructorships including that of Drug Recognition Expert. He is a five time national winner of the National Law Enforcement Challenge for excellence in Traffic Safety. Sheriff Shrum is an active community member, serving as the associate pastor of the Living Water Church, serving Team Honduras in humanitarian work, and is married to his wife of 20 years, Eileen and has a 13 year old daughter, Hannah. The Mission of the Grundy County Sheriff's Office is to lawfully and ethically carry out the duties mandated by the State of Tennessee while protecting the rights of all citizens as provided by the State Constitution and the United States Constitution. Additionally, the Sheriff’s Office will maintain social order and provide professional law enforcement services to citizens in the community, within prescribed ethical, budgetary, and constitutional constraints. This agency strives to enforce the law and maintain order in a fair and impartial manner, recognizing the need for justice, and consistent appearance of justice. The Sheriff recognizes that no law enforcement agency can operate at its maximum potential without supportive input from the citizens it serves. This agency actively solicits and encourages the cooperation of all citizens to reduce and limit the opportunities for crime and to assist in bringing to justice those that break the law.